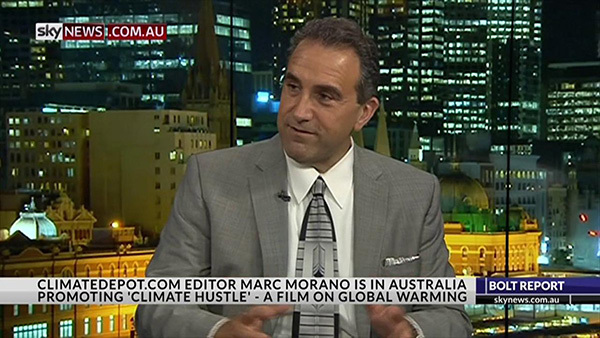 Aussie Jo Nova: "In the climate debate, few men are more central, more loathed and feared than Marc Morano. In the flesh, few men are more warm, witty and polished — an absolute gentleman and a delight to be around. He’s so effective he’s been rated one of the top 17 “planet killers”, and according to the Daily Kos, “Evil Personified”. Thank goodness he’s on our side.Not surprisingly, with so much going for him, he was the villain of the Merchants of Doubt documentary. Newsweek called him “King of the Skeptics” and Esquire Magazine devoted six thousand words to trying to unpack and investigate his key role in climate politics." "Like a bullet, it is now the #1 New Release in Environmental Science books. Let’s help keep it there. Right now, Leonardo’s worst fear is that you will buy this book and give it to people on the fence, impressionable teens, and any decent, deplorable teachers. Ask your local library to get a copy." 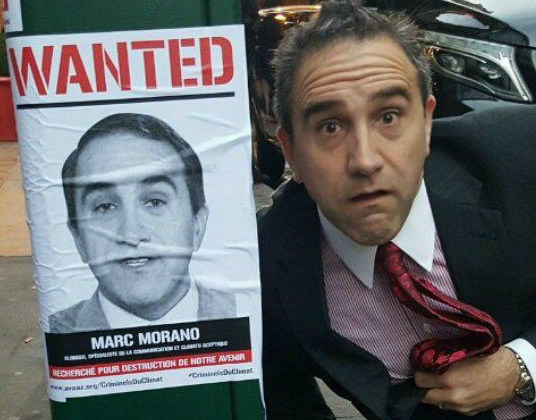 In the climate debate, few men are more central, more loathed and feared than Marc Morano. In the flesh, few men are more warm, witty and polished — an absolute gentleman and a delight to be around. He’s so effective he’s been rated one of the top 17 “planet killers”, and according to the Daily Kos, “Evil Personified”. Thank goodness he’s on our side. Not surprisingly, with so much going for him, he was the villain of the Merchants of Doubt documentary. Newsweek called him “King of the Skeptics” and Esquire Magazine devoted six thousand words to trying to unpack and investigate his key role in climate politics. For a few years Morano worked for Senator Inhofe, who at the time was virtually the only Republican standing up to the media, academia and the UN on climate change. When Leonardo DiCaprio and National Geographic released their top ten list of climate deniers, Inhofe was number one, and Morano, number two. Finally the man behind all this and Climate Depot — who is probably the closest to politics without being a politician — has written The Politically Incorrect Guide to Climate Change. Like a bullet it is now the #1 New Release in Environmental Science books. Let’s help keep it there. Right now, Leonardo’s worst fear is that you will buy this book and give it to people on the fence, impressionable teens, and any decent, deplorable teachers. Ask your local library to get a copy. With his book “Politically Incorrect Guide to Climate Change”, Marc Morano vies to be the Thomas Paine of the movement to save the world from the tyranny of climate catastrophists. He exposes the seemingly infinite number of absurd claims, and the almost unbounded hypocrisy and venality of the proponents of this clearly inhuman and scientifically implausible attempt to control mankind by controlling and, more importantly, restricting access to energy. This book is an unrelenting polemic of the best kind. The Weather Channel Founder, the late, great John Coleman, Anthony Watts, and many others praised Morano’s new book.